The Clinical Audit Teaching Toolkit (CATT) provides those who wish to train and teach others in clinical audit with a full range of games, activities and resources that will appeal to all learning styles. Stephen and Tracy have both taught clinical audit since the mid-1990s and their aim is to make training interesting, meaningful, practical, fun and memorable for all learners that give up their time to attend. To assist others in delivering high quality clinical audit training CASC created the Clinical Audit Teaching Toolkit (CATT) in 2011. Version one of the resource featured ten different activities that could be used to aid learning within a clinical audit workshop. The Healthcare Quality Improvement Partnership (HQIP) endorsed the resource and helped fund the creation of it. 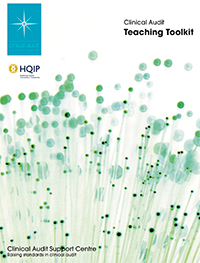 In 2014 we published version two of the resource with HQIP once again providing endorsement and support. Version two extended the CATT from ten resources to twenty. In 2017 we updated the resource. There are a number of new handouts available and materials have been checked an altered where necessary to ensure they are fully up-to-date. Access to the Clinical Audit Teaching Toolkit is freely available to everyone. Please be aware that there are in effect two parts to the CATT. Part one is the 56-page guide. Within this we devote a number of pages to each resource and you will find: a description, details of what you need to facilitate, when to use the resource, an approximate estimate of the time required and tips for trainers. In addition to the guide, you will also need to download materials from this website in order to conduct particular activities. Please see below for further details but as an example: resource three is the ‘RASE’ activity that helps learners better understand the subtle differences between research, clinical audit and service evaluation. The guide provides details of how to facilitate the RASE activity but you will need to download PowerPoint slides below and then print and laminate these to use the activity in your teaching workshop. Note: not all resources have associated materials to download but full details appear below. Resource 9: Data Analysis – hit or miss?